Cezar has a home! - Rocky Mountain Great Dane Rescue, Inc.
Cezar has a home with his current foster family in Monument, CO. Don & Jenifer are no strangers to the breed having volunteered with us in the past, as well as being previous adopters. They have the time and dedication to give their Danes, and Cezar is certainly deserving of that! Since coming into the rescue, Cezar had a few medical issues to overcome. He bloated while at the vet’s office for a checkup, and right after that battled a bout of pneumonia. He is now fully recovered, thanks to the quick actions of the staff at the clinic, as well as the care and efforts of his first foster Mom, Jocelyn. Cezar has been enjoying his new home with IO, formerly Lisa, whom Don & Jenifer adopted from us a few years ago. 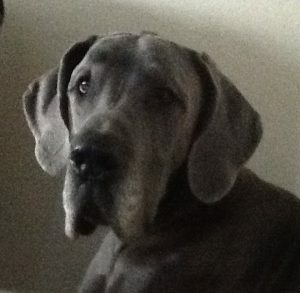 Both Don & Jenifer work from home, and love spending lots of quality time with their wonderful Danes. They hike frequently in the park near their home, and allow Cezar and IO to roam their very large, wooded yard. They even have a van they bought a few years so they can take their Danes everywhere they go! They are a Great Dane family for sure! Way to go sweet Cezar, enjoy your new life!